In early 2010 WWII veteran Jerry Yellin was introduced to a young man, Dory Klock, an eight-year Army veteran who had fought in Bosnia. Dory was having difficulty adjusting, keeping a job, and fighting drugs and alcohol. As a combat veteran, Jerry knew these inner struggles all too well. Dory’s wife and two daughters were suffering with him, and Dory’s mom Lin, Jerry’s friend, was beside herself. Then one day Lin called and asked Jerry if he could help her out. “Sure, Lin, anything,” he told her. She began weeping; she couldn’t speak. Finally, she asked, “Can you help me put Dory’s medals and ribbons on his dress uniform? We want to bury him in it, Jerry. He committed suicide yesterday.” Lin brought Dory’s uniform to Jerry’s home and he put the medals and insignias in place. When Lin left, Jerry broke down. His thoughts ran wild with the suffering so many are experiencing from the life and death of our warriors who experience combat and have nothing to hold onto when they come home. Jerry was a P-51 Pilot who flew 19 missions over Japan and saw the horror of Iwo Jima – a battle involving 90,000 soldiers on a small island where 28,000 people died. He knew from his own experiences as a returning veteran who suffered from what is now called Post-Traumatic Stress Disorder (PTSD) that the problem is overwhelming our nation. This article offers a scientifically verified, time-tested solution to how we can help our military personnel, veterans and their families. 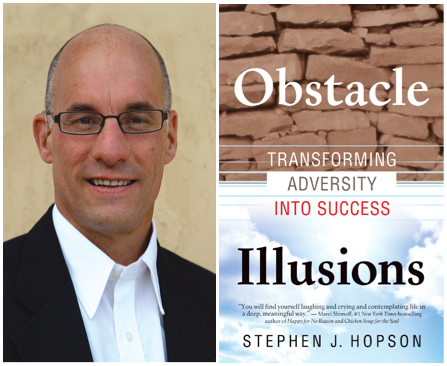 Read the rest of Real Life Solution: Combating PTSD with TM. Also posted on OpEd News and the Purple Heart Service Foundation as Combating PTSD. Yosra Elkhalifa felt stressed. She sat in an individual study room at the Blank Honors Center, her midterm in Theory and Practice of Argument just an hour away. But instead of cramming, she began to meditate. She did not twist into a yogic pose but sat comfortably in a straight-backed chair with her eyes closed and her hands folded in her lap. The University of Iowa freshman said transcendental meditation has given her a more positive outlook on life, though she has been practicing for only six weeks. Nationally, the number of Americans meditating is increasing. According to a 2007 U.S. Census Bureau Survey, nearly 10 percent of the population over 18 practices some form of meditation, up from about 8 percent in 2002. Locally, both transcendental and Buddhist meditation techniques are growing in popularity, Iowa City instructors said. Linda Rainforth, who taught Elkhalifa transcendental meditation, conducts free introductory lectures. She said there are well more than 100 Iowa City residents who meditate, with thousands in Iowa. Her students, who range from 6-year-olds to seniors, often meet at the Iowa City Public Library for group meditation. Before beginning, they decide how long to meditate, then sit comfortably in their chairs with their eyes closed; the only sound is the ticking of a nearby clock. “Take a few minutes to come out,” Rainforth whispers when the time is up, prompting students to slowly open their eyes. College students who want to learn the art of transcendental meditation can take courses, which require a tuition payment. The David Lynch Foundation, a nonprofit group based in Fairfield, Iowa, aims to fund scholarship programs for schools and other groups and pay for transcendental-meditation training for those wanting to learn the technique. The organization boasts many celebrities on its advisory boards, such as hip-hop pioneer Russell Simmons and actor Stephen Collins. Katie Nimmer-Tsilosani, a North Liberty resident, said she runs a demanding childcare business in her home. “[Transcendental meditation] provides me deep relaxation as well as a boost of energy that is much appreciated in my busy and fun life,” she wrote in an e-mail. Link to rest of the article: http://www.dailyiowan.com/2011/03/24/Metro/22323.html. This article was later mentioned in Third Age.com﻿: Meditation On the Rise in America. The Transcendental Meditation® technique may be an effective approach to improve math and English academic achievement in low-performing students, according to a new study published in the journal Education. Students who practiced the Transcendental Meditation program showed significant increases in math and English scale scores and performance level scores over a one-year period. Forty-one percent of the meditating students showed a gain of at least one performance level in math compared to 15.0% of the non-meditating controls. Among the students with the lowest levels of academic performance, “below basic” and “far below basic,” the meditating students showed a significant improvement in overall academic achievement compared to controls, which showed a slight gain. “This initial research, showing the benefits of the Quiet Time/Transcendental Meditation program on academic achievement, holds promise for public education” said Sanford Nidich, EdD, lead author and professor of education at Maharishi University of Management. “The findings suggest that there is an easy-to-implement, value-added educational program which can help low-performing minority students begin to close the achievement gap,” said Dr. Nidich. The middle school level is of particular concern to educators because of low academic performance nationally. Sixty-six percent of eighth-grade students are below proficiency level in math and 68% are below proficiency level in reading, based on 2009 National Assessment of Educational Progress data. Faculty surveyed as part of the project reported the Quiet Time/Transcendental Meditation program to be a valuable addition to the school. They reported the students to be calmer, happier, and less hyperactive, with an increased ability to focus on schoolwork. In terms of the school environment, faculty reported less student fights, less abusive language, and an overall more relaxed and calm atmosphere since implementation of the program. The study was supported by the David Lynch Foundation. • This study evaluated change in academic achievement in public middle school students practicing the Transcendental Meditation program compared to non-meditating controls. A total of 189 students (125 meditating and 64 non-meditating students), who were below proficiency level at baseline in English and math, were evaluated for change in academic achievement, using the California Standards Tests (CST). • Ninety-seven percent were racial and ethnic minority students. • The Transcendental Meditation program was practiced in class twice a day as part of the school’s Quiet Time program for three months prior to posttesting. • The Transcendental Meditation program was taught in the context of a school-wide Quiet Time program in which students voluntarily chose the Quiet Time program in which they wanted to participate. 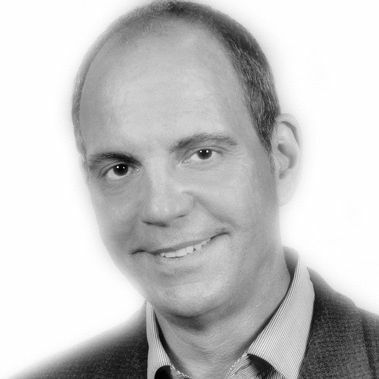 • The Transcendental Meditation technique is a simple, natural, effortless technique that allows the mind to settle down and experience a silent yet awake state of awareness, a state of “restful alertness.” Practice of this stress reduction program does not involve any change in beliefs, values, religion, or lifestyle. • Compared to eyes-closed rest, research has found that Transcendental Meditation practice is characterized by decreased activation or arousal of the autonomic nervous system, as reflected in decreased breath rate and lower sympathetic nervous system activity. The Transcendental Meditation program has been shown to increase electroencephalographic (EEG) brain integration and coherence, especially in the frontal area of the brain, responsible for higher-order processing. • Other published research on high school and college students has shown reduced psychological distress, improved positive coping ability, decreased blood pressure, reduced cardiovascular reactivity to stressful stimuli, reduced absenteeism, and decreased school suspensions. • Results of the current study indicated improvement for meditating students compared to controls on English scale scores (p = .002) and math scale scores (p < .001). A greater percentage of meditating students improved at least one performance level in math and English compared to controls (p values < .01). • A matched-control subgroup of 50 students in each group yielded similar results. • According to the National Assessment of Educational Progress (NAEP), 68% of eight grade students nationally are below proficiency level in reading and 66% are below proficiency in math, based on 2009 data. • Nearly 1.3 million students did not graduate from high school in 2010. 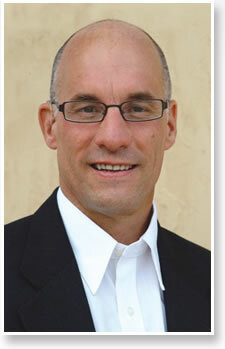 Posted today, March 21, 2011: New research shows Transcendental Meditation improves standardized academic achievement. Source: EurekAlert! 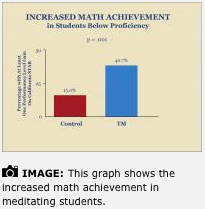 TM Blog reports (with video): “Meditation mends troubled school in San Francisco” – SF Examiner, and Struggling students find TM improves academic achievement: New research. MUM BLOG Reports: Transcendental Meditation: Improving academic performance. See Related Research: Transcendental Meditation Effective Antidote to Record Stress Levels in School Students. 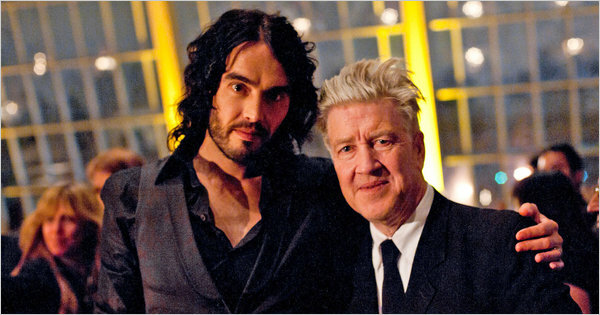 POSTER BOY Russell Brand with David Lynch at the December Met fundraiser for Mr. Lynch’s foundation, which promotes Transcendental Meditation. 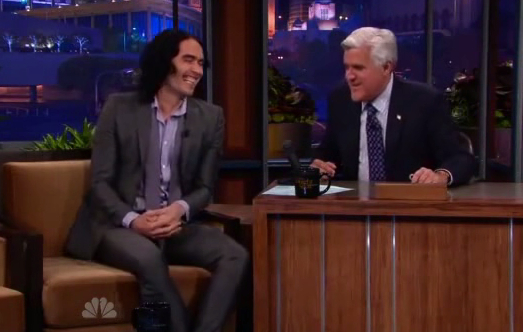 RUSSELL BRAND, the lanky British comedian, has made a career of his outrageous antics. While a host at MTV UK, he went to work dressed up as Osama bin Laden. At the network’s annual music awards, he likened Britney Spears to a “female Christ.” And he was fired from the BBC after leaving raunchy messages on the voicemail of a 78-year-old actor, a comic bit that even his country’s then-prime minister felt compelled to denounce. It is jarring then, to say the least, to hear Mr. Brand, 35, speaking passionately and sincerely about the emotional solace he has found in Transcendental Meditation, or TM. Yet there he was in December, onstage at the Metropolitan Museum of Art (as his new wife, the pop singer Katy Perry, waited backstage), describing how TM has helped him repair his psychic wounds. Mr. Brand was the M.C. at a benefit for the David Lynch Foundation, an organization that offers TM at no cost to troubled students, veterans, homeless people, prisoners and others. Like many other guests in the room, Mr. Brand has been personally counseled by Mr. Lynch, the enigmatic film director, who has been a devout practitioner of TM, founded in 1958 by the spiritual leader Maharishi Mahesh Yogi, since its first wave of popularity in the late ’60s. That is when Mia Farrow, after her divorce from Frank Sinatra, joined the Beatles in the Maharishi’s ashram in Rishikesh, India; when George Lucas started meditating and was rumored to have based the Yoda character in “Star Wars” on the Maharishi (the resemblance is eerie); and when the talk show host Merv Griffin, after being introduced to the technique by his tennis buddy, the actor Clint Eastwood, invited the Maharishi to be on his show in 1975. Since then, the celebrity endorsement, and therefore the enrollment numbers, had quieted down. That is, until the last three years when, according to the national Transcendental Meditation program, enrollment tripled. At Trinity College in Hartford, the women’s squash league began meditating together after every practice last year. The Doe Fund, an organization that assists the homeless, has begun offering TM to its residents along with computer skills and job training. And Ray Dalio, the billionaire hedge-fund manager of Bridgewater, has long credited the success of his funds to his daily practice. The Transcendental Meditation program attributes the spike to a series of recent studies that suggest TM can help reduce blood pressure and stress, and to the relatively recent affordability of TM. (The adult course, which had ballooned from $75 in the ’60s to $2,500 in 2007, dropped, because of the economy, to $1,500 in 2008.) No less important has been Mr. Lynch’s foundation, started in 2005, for which enlisted celebrities like Mr. Brand, interrogated often by news outlets about their diets and alternative lifestyle remedies, have been preaching about the technique. ON the afternoon before the benefit, Mr. Lynch, 65, arrived at the museum, holding hands with his wife, Emily Lynch, 32, and was escorted by a museum employee to a green room downstairs. Mr. Lynch, like a cartoon character, has maintained the same uniform for decades: a pressed white shirt under a boxy black suit and a hedge of gray hair. He scooped up a soggy egg-salad sandwich from a tray and explained what brought him to the practice. It’s easy to shrug off such utterances as hokey, New Age prattle — who can forget Jeff Goldblum’s flaky character in “Annie Hall” on the phone, complaining that he’d forgotten his mantra? — but less so when the person reciting it has dreamed up his most widely admired, vivid films on the days when he was dropping out of consciousness for at least 30 minutes a day. In a Byron Katie Newsletter my son sent me. Stephen Mitchell is BK’s husband. Hilary Hillman, a Community News Specialist for The Daily, files a report on the Victoria School for Ideal Education. Have a look inside this Canadian independent elementary school in Victoria, BC where children practice Transcendental Meditation twice a day. The younger children perform a simple walking meditation version of the technique, which does not involve any special breathing or centering techniques as mentioned in this report. Children over 10 years of age practice TM sitting comfortably with eyes closed. In these seemingly more progressive times, the introduction of yoga and/or meditation, especially the Transcendental Meditation technique, is becoming part of an ongoing healthy trend in education. Also see this wonderful video on the Victoria School for Ideal Education posted in this Message from Monique.